NYC has an extensive underground metro system that millions of people use every day. Similar to London, everyone pays $1 to purchase their metro card and will refill the card once depleted similar to a debit card. If you lose your card, fork over another $1. Basic fares cost $2.50 on the card or you can pay for single-ride tickets for $2.75. Otherwise, a 7 day pass costs $30. One-way taxi rides around Manhattan will approximate $10, give or take, depending on where you’re going so if you have a group of 4 people…this might be a more cost efficient mode of transportation. Or if you’re just in a hurry (hey, it’s the New York way!) a cab doesn’t break the bank. Below is a suggested itinerary based on proximity for several days to help in your exploration of one of the world’s most famous cities! Arrive at Grand Central, take it all in. Imagine the number of people who float through this grandeur train station (that used to be the mansion owned by the Vanderbilt family) on a daily basis…you may need a wide angle lens to capture its full commotion! Head down to Rockefeller Plaza and go to the Top of the Rock. Make an online reservation ahead of time to avoid the long line. Get there early to avoid the crowds. In my opinion, the Top of the Rock view is better than the Empire State Building because 1) Top of the Rock has three levels of roof top tiered likea cake, the second and third not having the gated fence or glass that can ruin photos 2) on the north side, you get an unobstructed view of Central Park (the Rockefeller building blocks some of the view from the Empire State building) and on the south side you get an awesome view of the Empire State Building. The east and west views aren’t so bad either! Not to be missed. If you’re a Today show fanatic, get to the plaza early for a front row taping beginning at 7am. Walk to Times Square where you can snap a few photos, glimpse the famous NYE ball, and stop by TKTS if interested in discounted Broadway shows. But DO come back here at night to see the Square all lit up and sit on the famous red steps to take it all in…I prefer the view at night so if you can only visit once, come at night. Times Square is situated at the junction of Broadway and Seventh Avenue and stretching from West 42nd to West 47th Streets. Head over to lunch in the Hell’s Kitchen area where restaurants can be found galore. It’s so fun strolling through Central Park but it’s HUGE. I recommend taking a cab up to Strawberry Fields which is 2.5 acres in Central Park that pays tribute to John Lennon who was shot in NYC (it’s a quiet area). There’s a large mosaic on the side walk that says “Imagine.” It’s located on the West side between 71st and 74th street. Afterwards, feel free to just walk around aimlessly. The Lake is a stone throw away where you can even rent kayaks to float around the lake on. Tired from all that standing? Head to Greenacre Park located near Grand Central Station. The city’s secret gardens are a terrific place to escape the noise and busyness of a major city and even features a 25 foot waterfall. You can sing the lovely song “Greeeeeen Acres is the place for me….FINE LIVING…is the life for me” while you skip over. Greenacre Park is located on 51st Street. Jump in a cab and head to the 911 Memorial. If you want to do the museum tour, buy tickets in advance (like well in advance) and keep in mind that you will need approximately 3 hours to go through the 7 floor museum. The museum is brand new in 2014 and the line is outrageous. Factor in about 20 minutes to get through security in addition to your wait time if you have tickets. My parents learned a good tip that when you come to the revolving doors, go through them as there are a lot of recordings and personal artifacts found at ground zero that are very compelling. Many visitors bypass this entrance thinking it’s an exit. The museum is free on Tuesdays after 5pm. If you opt not for the museum, the outdoor memorial is a sight to see and a lot to take in (oh, and it’s free to visit). This is meant to be a quiet zone so please be respectful of those around you. Look for the Survivors Tree that still stands after the collapse of the towers. It’s been revived and replanted and has a rope around it unlike the other trees in the vicinity so you’re sure not to miss it. That new looking building next to the memorial made of all glass and cut like a diamond is the One World Trade Center, aka Freedom Tower, the lower portion of the building is made of differing materials recovered from the fallen twin towers. If you’re not already starving, walk downtown towards Wall Street, stop for a photo op at the Federal Hall National Memorial, where George Washington took the oath of office as our first President (his statue is in front), and the New York Stock Exchange, across the street. Unfortunately, the Exchange is no longer open for tours but you will see a congregation of people taking pictures with the bull of Wall Street and his golden horns (just don’t be one of those people taking pictures with its family jewels…mama won’t be impressed). 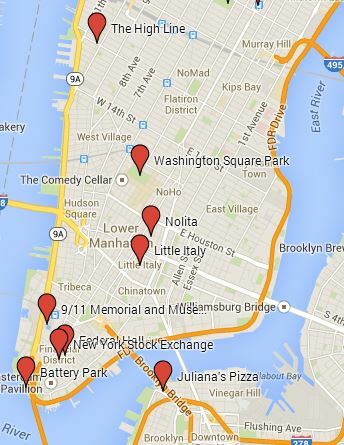 If that doesn’t interest you, just snag a cab from the 911 Memorial to Battery Park. Battery Park is where you can see the Statue of Liberty from afar. Whether or not you’ll get to tour both depends on how early you can get to the ferry terminal and how large the crowds are. Having advance tickets up to the crown is a good reason to get off at Liberty Island (must be booked 3 months in advance). Otherwise, view Lady Liberty from the ferry (without disembarking) so you can spend the bulk of your time at Ellis Island, the famed portal to the “New World” for millions of immigrants. It’s the more compelling visitor experience of the two. If time is of the essence, snap a photo of Lady Liberty herself from the banks of Battery Park and then head to lunch. Pop in a cab and head over to Juliana’s pizza in Brooklyn. Guide books will send you to Juliana’s neighbor, Grimaldi’s Pizza, where you will find an outrageous line. Don’t fall trap! Juliana’s Pizza and Grimaldi’s Pizza are related by a separated family. Be sure to read the history on the menu (it’s interesting!) and then afterwards, walk down to the East River (turn right when exiting the restaurant) to get a great view of Manhattan with the Brooklyn Bridge in the background. Photo op! Walk up to Nolita (North of Little Italy) for some shopping. Nolita is one of the hottest (and not cheapest) shopping strips in the neighborhood. Elizabeth and Mott and Mulberry streets are dotted with stylish shops between Lafayette Street and the Bowery, below Houston to Kenmare. You can read about all the best shopping in the various neighborhoods here. Still in the vacinity for dinner? Check out the Spotted Pig where you may rub elbows with celebs at this hipster-casual restaurant that also happens to have a Michelin star at less than Michelin star prices! 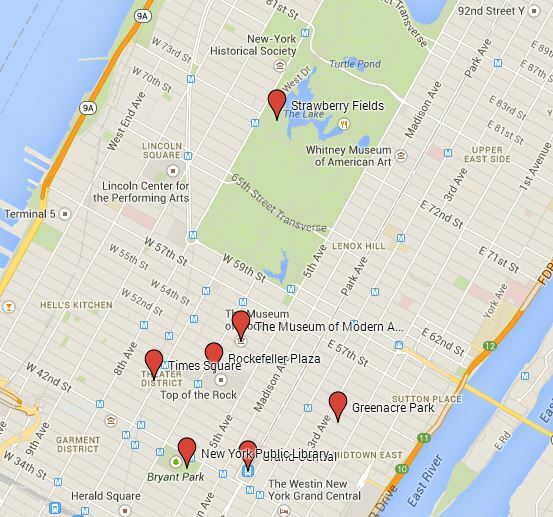 Need a low-key NYC foody day? So you still have some time to explore? Head to the Chelsea High Line – This one mile stretch of old train tracks turned park is situated above the western portion of Chelsea. It’s a very leisure stroll and at the end of the park sits several food vendors that are perfect for a quick lunch with a view over the Hudson River to New Jersey. Tell your cabbie you want to go to the High Line and to drop you off near the rail yards at West 30th Street to begin your stroll. If none of the food options tickle your fancy or the weather doesn’t permit, head over to the Chelsea Market for a bite to eat. OR, head back down to the financial district and check out Stone street for a drink or bite to eat. You will probably do a double-take. This narrow cobbled street is more redolent of Europe than downtown NYC. It is crowded with restaurants whose owners fight for pavement space on fair days for their chairs and tables. Grab a seat and eat Swedish meatballs, Greek kebabs, Italian pizza or Mexican enchiladas. Pop over to Washington Square Park for a break. As the sun starts to set, head to this carnival of a park located in Greenwich Village, where street musicians are always performing and crowds of “Villagers” and NYU students gather. Spend some time relaxing here before heading somewhere in the vicinity for a terrific dinner (the restaurants downtown are the best in the city). Check out the OTHER Alamo at Astor Place (Lafayette and 8th Street), and if you’ve got the strength, you can try and make it spin. Explore Eataly, a huge Italian market with a cheese and wine dining counter. Buy your cheeses fresh and a bottle of wine or Gelato in the market and enjoy a happy hour at one of the free standing tables…a hot spot! They also have a rooftop bar if weather permits. Eataly is just across the street from the famous Flatiron Building know for its flat-looking architecture and featured in so many movies. Rest your dogs at one of the roof top terraces if weather is nice before dinner or head back to the hotel to freshen up prior to dinner. Graffiti Hall of Fame in Harlem : The wall is one of the boundaries of the Jackie Robinson Education Complex and is a brilliant show of what can be achieved with cans of spray paint. I’ve not been to Harlem but this was recommended in a blog I came across. Fort Tryon Park : On the rather northern side of Manhattan you can find what looks like English countryside with a cloistered chapel. Fort Tryon Park is a reassembled chapel with thick stone walls, stained glass windows set in gardens brimming with colorful flora and exotic wildlife. Fort Tryon was designed by the same man who helped create Yosemite National Park and you can find it at 190th Street on the west side. If you want to catch a taping of your favorite talk show in NYC, do your due diligence and plan well in advance as some tickets can only be reserved a year in advance! You can see a listing of NYC tapings here. You can also read more about restaurant recommendations on my blog post, NYC Restaurants, Roof Tops and Fancy Drinks! I hope to grow this post and would love any suggestions based on your own experiences! This entry was posted in New York City, Travel, Uncategorized and tagged 9/11 Memorial, 9/11 Museum, battery park, broadway, Central Park, Chelsea, Chelsea High Line, Chelsea Market, eataly, federal hall national memorial, fort tryon park, Graffiti Hall of Fame, Grand Central, Grand Central Station, greenacre park, greenacres, High Line, itineraries, Itinerary, little Italy, lower manhattan, Manhattan, midtown, MOMA, museum of modern art, New York, New York City, New York Public Library, new york stock exchange, NOLITA, NYC, NYSE, plaza, Rockefeller, statue of liberty, strawberry fields, TKTS, top of the rock, travel, wall street. Bookmark the permalink.